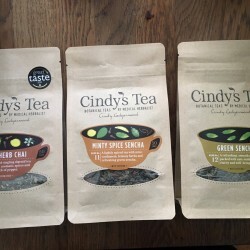 Cindy started her business from her kitchen table, blending pharmaceutical quality herbs to make healthy teas that can help with everyday ailments. As a qualified medical herbalist with a degree in neuroscience, she knows what she's doing! Cindy's recipes are based on Western herbal medicine along with strands of Ayurvedic and Chinese medicine. Her teas are specially created to help with health and wellbeing, and contain no hidden nasties such as sugar or flavourings. Plus they all taste amazing – clean, fresh and bursting with exciting natural flavours. Cindy has been awarded 11 Great Taste Awards for her range, plus the prestigious Scottish EDGE award for entrepreneurship and innovation.